JOHANNESBURG (AP) — South Africa wrenched the first rugby test out of England's hands by coming from 24-3 down to win 42-39 at Ellis Park on Saturday, saving Siya Kolisi's first game as the Springboks' first black captain. The Springboks wingers scored tries on their test debuts, two for right wing S'Busiso Nkosi and one for left wing Aphiwe Dyantyi, to help a young South Africa win after looking ragged under an early England onslaught. 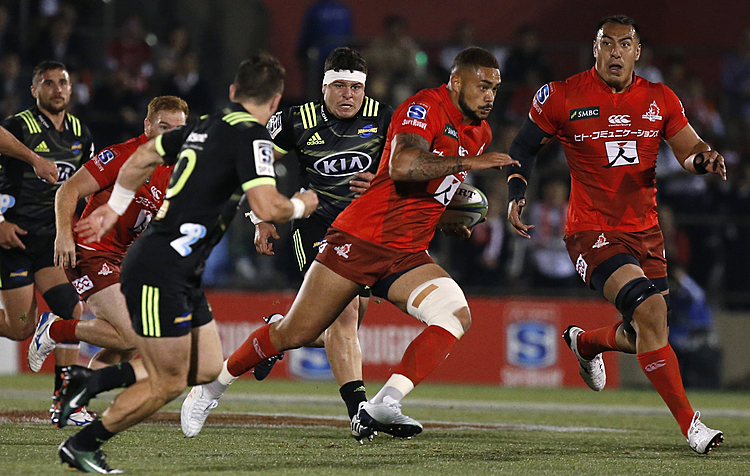 That onslaught produced three tries and 24 points from the visitors in the first 16 minutes. After their fightback — racking up 36 points to England's three in the middle part of the game — the Boks held on grimly at the end as the momentum changed wildly again. England was dominant once more in the last 10 minutes and scored two late tries. "I thought the first 20 minutes we were, at times, brilliant," England coach Eddie Jones said. "Maybe we got seduced by the game and that might have been the cause for some uncharacteristic and costly errors." Both teams scored five tries, while South Africa flyhalf Handre Pollard kicked 17 points, punishing England in the second half for its high penalty count and kicking a final penalty four minutes from fulltime that was ultimately enough to get South Africa home. The comeback gave Kolisi's team a nerve-jangling but desperately welcome win and South Africa reason to be positive for the future under new coach Rassie Erasmus following a dismal past two years under Allister Coetzee. "I was really nervous. 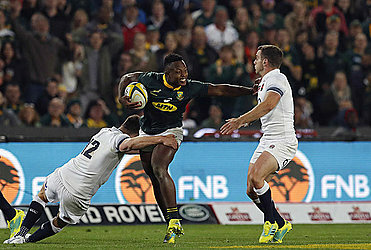 It was a tough time to start off a game like that," Kolisi said. He praised the senior players around him for helping pull South Africa together after the disastrous start: "We took charge and told the guys to calm down." Jones' side looked good for the first 20 minutes and the last 10 in Johannesburg, but lost its way badly in the middle. Jones said that was mainly down to "individual errors" and ill-discipline. "They (South Africa) got a get-out-of-jail card," Jones said, although he did praise South Africa for winning a "wonderful game of rugby." More than just looking good, England was rampant early on, with fullback-turned-wing Mike Brown sliding in at the left corner inside the first five minutes. Fullback Elliot Daly and center and captain Owen Farrell also scored as South Africa was torn apart out wide. Farrell converted them all and kicked a penalty for 24-3 to England after 16 minutes. "I was worried," Erasmus said. "There was a lot of young guys on the park ... it could have gone really bad for us." Recalled England-based scrumhalf Faf de Klerk began the Boks' comeback with the first try. Nkosi scored in each corner, the second after combining brilliantly with fellow debutant Dyantyi. Fullback Willie le Roux, another overseas-based player recalled by Erasmus, got the fourth for South Africa, which went to halftime 29-27 ahead. Suddenly, England was so rattled that Jones threw on New Zealand-born forward Brad Shields for his debut off the bench before halftime. Dyantyi pushed the home team further ahead in the second half, 39-27, making England pay immediately for a yellow card to prop Mako Vunipola in his 50th test. Tries for England lock Maro Itoje and wing Jonny May in the last 10 minutes set up a thrilling finish, when England set up for one last attack from a lineout with about a minute to go. South Africa stole the throw-in — via another impressive debutant, second-rower RG Snyman — and clinched a great start to a three-test series in which both teams are desperate for success.